Padwal/Parwal or Snake Gourd is healthy, nutritious and has immense medicinal value. You can use it in a curry, a stir fry or make pakoras! But the most delectable of all are the stuffed ones. You can use your creative juices to invent and create fillings sweet or savory and stuff the Parwal (Snake Gourd) tubes. 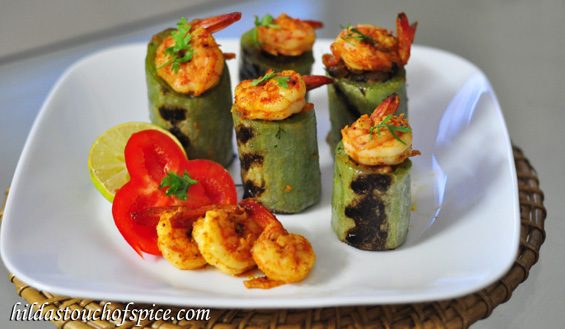 Today’s recipe is snake gourd stuffed with a stir fry prawns/shrimp which is loved by many. The combination of Snake Gourd and Prawns is awesome. If you have enjoyed prawn stir fry or prawn chilli fry then you will really enjoy and relish them stuffed in the Padwal. For this preparation, it is preferable to use very fresh small prawns which are better for stuffing and also eliminates the trouble of deveining. If you are unable to get them then make sure you de-vein them and cut into small pieces. Reserve a few big ones for garnishing. Wash the prawns & drain completely. Marinate the prawns with ginger-garlic paste, lime juice, ¼ tsp. red chilli pwd., ½ tsp. turmeric pwd. for about 20 mins. Heat oil in a kadhai/wok . First, lightly sauté green chillies for a few seconds and then sauté onions till translucent. Reduce heat; add the remaining ½ tsp. turmeric pwd., ¼ tsp. red chilli pwd., coriander pwd. and then add the tomatoes. Cook on medium heat till the tomatoes are slightly soft. Now add the marinated prawns and stir fry on high heat till the prawns are lightly cooked. Do not overcook the prawns or they will turn hard. Add sugar, pepper pwd., garam masala pwd. and stir to combine well. Adjust salt to taste. Taste to check seasoning. Stir in the coriander leaves. Your prawn stuffing is ready! Wash & dry the snake gourd. Cut off the ends & scrape off the white waxy surface lightly with the edge of a knife. (Do not use a peeler). Chop the snake gourd into about 11/2 inch pieces & gently scrape/scoop out the pith & seeds from the tubes. Make sure the tubes are intact. Boil water in a sufficiently large pan with a pinch or two of salt. Drop in the tubes of snake gourd when the water comes to a rolling boil. Let it boil for 2-3 minutes or till the tubes are tender but firm. Do not over boil. Switch off the heat & transfer the snake gourd tubes to a bowl with a slotted spoon or alternatively you may drain out the water by pouring the contents in a sieve or strainer. Let the snake gourd cool down completely. 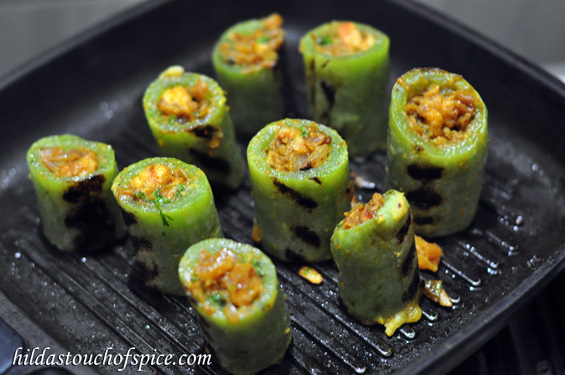 Fill the prepared prawn/shrimp stuffing in each snake gourd tube. Seal one end of the tube with potato mash & arrange on a plate/tray. Now heat a grill pan/non stick frying pan with a little olive oil or vegetable oil. Arrange or gently slide in the stuffed snake gourd. Grill on each side for about 5 to 7 mins. or pan fry. You may bake in the oven if you so wish. Drizzle or brush with olive oil if required while grilling or pan frying. Transfer to a platter and serve garnished with prawns/shrimp as a starter or on the side with rice & dal, pulao or with chapattis, rotis phulkas or any Indian bread.